It has always been a dream of mine to own a bakery and about two years ago I quit my job in Human Services and started working at a restaurant where I soon became the baker! I was given some guidelines on what to make, but I always get to create a daily special and it can be just about anything! I’m a junk food vegan and I love recreating my favorite non vegan snacks, so after getting a lot of positive feedback and a lot of support from my friends and family, I decided to start Pig Out! How long have you been vegan and what helped you to make that change? I have been vegan for about a year and three months, but I was vegetarian for about 5 years before that. I always thought eating meat was gross, since I was a kid, and I’ve always loved animals. As I’ve gotten older and I’ve educated myself more on what animal products do to our bodies, and the horrible conditions animals suffer in, it just makes more sense to live a vegan lifestyle. What is your favorite item that you create and why? Do you have any other favorite vegan makers? Yes! It’s been so nice getting to know other vendors from these markets! Some of my favorites are Grubbys, The Vegan Potter, Ms Jennifer Lee, The Striped Cat Metalworks, Bartlebys, and Like No Udder! It is all evolving organically since Forest is a craftsman and as a bodyworker myself, we are finding ways to promote our lifestyle and discoveries through each piece we make, with the intention on how to truly embody your ultimate human experience. To share with subtlety the practice of being present, is truly humbling, and the products we make not only allow us to practice it deeper, but share the goodness with everyone else. I have been back and forth as a vegetarian/pescatarian for about 12 years and the both of us went completely vegan a year and a half ago. For the planet, the animals and our health, it just doesn’t make any sense to take any other path. We honestly have so many pieces we want to create, every time something new comes together, it becomes my new favorite! Do you have any other favorite vegan makers? Tell me about them, too! 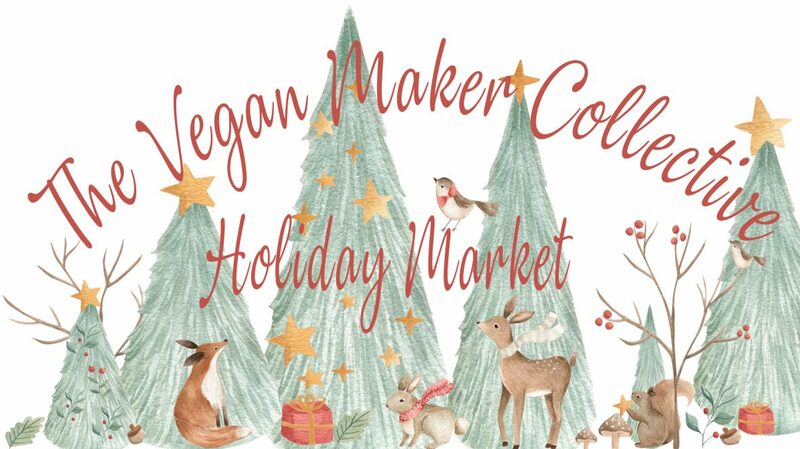 We haven’t really met any other vegan makers, but are excited to meet all of you! We decided to start VURRITO because we have a passion for cooking and creating, along with our love of interacting with people. Creating a business that has little waste and can be composted / recycled was important to the environmentalists in us. We wanted everyone to have the opportunity to make a choice that is delicious, healthy, sustainable, familiar, cruelty-free, and environmentally friendly. Our goal is to have a guest-base that is passionate about our products and offerings. Building Vurrito and bringing it to life has been very exciting. Making food that people love (and crave!) is a fantastic feeling. Making that same food that is also good for so many important reasons – well, that is something truly special and satisfying. Casey has been vegan since 2014 and Chris has been vegan for over a year now. Building Vurrito really has been extremely helpful in making that change. Funny thing about being vegan …started out for our health, and then it turns to the animal side. The more you know! I think our favorite item we create is always the next one that people love. It may be the new Mac ‘N Cheese Vurr-ger, but our Breakfast Vurrito (Home Fries, Chorizo styled crumbled seitan, and our house made queso in a huge tortilla) has probably been our favorite for the longest time. Our favorites are always the ones that our guests are most passionate about. One of our favorite vegan makers has been integral in boosting our presence. Chris and Karen at Like No Udder. Their ice cream flavors are fantastic. I like that they stock some of my favorite vegan pantry items, too. We have a special spot for Celebrated, because Becky started about the same time we did out of Pilotworks, and it has been great to see her business take off! I’ve been vegan for 3ish years. I was vegetarian for a long time for environmental reasons. As I learned more about animal abuses I slowly cut out dairy. As I learned more, I was able to slowly but surely cut out more animal products and it’s been great. What is your favorite item that you create and why? My favorite item is the nuggets. Getting the texture just right was super hard and there was a lot of trial and error. I also will hand out nuggets for sampling when customers have never heard of seitan, and I love watching them eat it, love it, and then try to study what it is… and then order a whole batch. My favorite vegan makers: Mimi of VO2 Vegan Cafe and Keith of Taco Party. I worked with Mimi for 3 years at VO2 and she taught me so much about vegan cooking, veganism, and running a business as a strong woman leader. Keith is super talented and hardworking, and gave me such a warm welcome to the food truck community, with lots of wise advice. Taco Party is right by my house and I go there all the time. I think it’s genius. I’m about to get personal, oh boy. Okay. As someone who suffers from severe depression since childhood, finding things that bring me joy is something I don’t take for granted. I had bought a metal stamping kit after being hospitalized due to a suicide attempt, but ultimately gifted the kit to a metal smithing friend that I’d met at the hospital (who I won’t name for privacy reasons). Months passed and I thought about it some more, knowing I needed something more in my life to keep me grounded. So, I bought another kit. And some blanks. And a hammer. And man, did I start hammering. Immediately, it felt right. I had found a passion I didn’t know I had. I can’t wait to continue expanding my knowledge of jewelry making, and really start to hammer out some unique designs. My products have found their way into shops all over the lower Cape, and it seems to really be taking off thus far. I cannot say how thrilled I am to have found something that both brings me joy and helps support me financially, due to my inability to work long hours thanks to physical and mental disability. Sometimes, life just works out! See more of Jordan’s work on her website Eastham Stamp! How long have you been vegan and what made you decide to make that change? I became vegan in late May of 2016. First, I had gone pescatarian. Then vegetarian. And then vegan! All within about a month or two. None of my family or friends thought I could stick with it due to the fact that I hate vegetables and was a total meat freak! Haha! But here I am, still vegan and proud of it. I owe a lot of my motivation behind going vegan to a friend named Michelle Dube, also known as The Vegan Fleetian on Facebook. She introduced me to farm animal rights, and there was absolutely no going back. Ultimately, though, don’t we all owe it to the animals who suffer needlessly at the hands of humans? They are always the reason behind a new vegan. Their silenced cries. Their terror. Their pain. Knowing they feel and experience the world the same way I do— how could I pay someone to hurt them? We owe it to them and to the future to do the right thing. Woah, that got dark. Sorry! Hahaha! I really enjoy making my “CODDER” bracelets, as they were my first idea. I’m a proud Cape Codder, and appreciating my roots is important to me. This little island and its natural beauty has given me so much hope. However, I just recently came out with a horseshoe crab design that forces me to use an engraver- which I both love and hate to do! It’s less common than I’d like to make one that’s good enough to hit the shelves, but when I do, the feeling of achievement is unreal! Some designs I’m looking forward to will be my new Tree Hugger Animal Lover line… More about that to come soon, stay tuned! 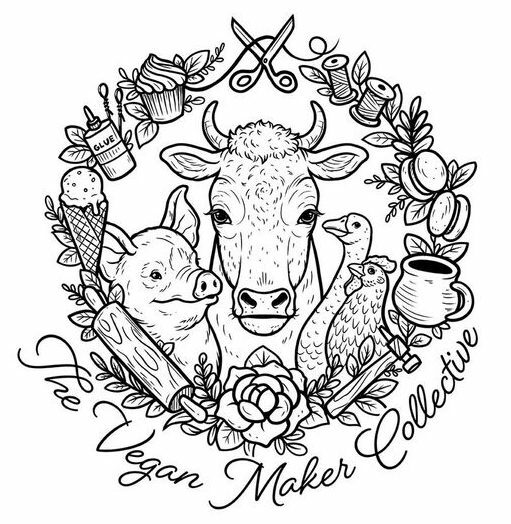 Who are other vegan makers that are favorites of yours? Please tell me about them! My favorite vegan maker of all time is Tamara from The Striped Cat Metalworks. I admire her work so much, and hope that one day I can be half as talented and as passionate as she is! I’ve had her do a few custom pieces for me and they are staples in my own and my friends’ wardrobes. I get so many compliments on her jewelry, and I can’t wait to purchase more in the future! Steve and my friends at work told me “Do it”! Follow along with all that Liz is doing with her products and where you can find them at her Facebook page Barrett’s Garden. She is in so many stores now and we can help her to be found in even more places! What made you decide to make the change to veganism? Steve came home one day and said “I’m going vegan do you want to with me?” I said “OK”. That was 5 years ago. Vegetarian for long time before that. What is your favorite product that you make and why? I really like the Farmesan because it’s so versatile. Pesto, alfredo, toppings, straight from the container when you need a ‘punch’ of something savory! Tell me about any other favorite vegan makers you love! I admire all the other vegan makers. I love to see people unfolding and creating and loving and being and the best part is……….VEGAN! I was strongly involved in the Animal Rights movement in the 1980’s. I did a lot of the graphic work for two groups in Boston, CEASE, and The Alliance for Animals. During that time period I became vegetarian. Since then the amount of vegan food I ate simply increased. Although the ‘lifestyle’ of being vegan, not wearing leather nor fur and not buying products made from animals was a change I made in the late 80’s. Being an artist I also avoided products such as brushes made from animal fur, rabbit skin glue and even ‘ivory black’ paint which is made from burnt animal bones. So in all, being vegan is something I just morphed into during the last 25 years. What is your favorite item to create and why? My pencil drawings have been my favorite items to create. I get a great deal of satisfaction when a drawing is finished and it’s mostly the way I’d like it to be. In 1987 I was asked by a group called, The National Alliance for Animal Legislation, to produce a drawing to be given in turn to Dr. Jane Goodall as an award for her achievements in the conservation of Chimpanzees. Needless to say I was thrilled to do that drawing. They invited me to their conference in Washington DC where I got to meet her as well. The next year they asked me to do a drawing for the author Alice Walker as an award for a book she wrote about her relationship with a horse entitled, ‘Am I Blue’. So these experiences gave me the idea to use my work to help raise funds for ‘The Alliance for Animals’, a Boston based rescue group I worked with in the early 1990’s. So I created a drawing of cats gossiping entitled, ‘The Gossips’, to be used as a fund-raising poster. It was a pastiche of an old Saturday Evening Post cover by Norman Rockwell. In the 1990’s I also did some illustrations directly for a few animal rights magazines. I’ve been drawing since I was a boy. I started drawing because I discovered Marvel Comics when I was about 11 or 12 and I lit up because of that. I’ve also enjoyed drawing and painting animals and birds as well as many subjects. Environmentalism and conservation are also very important to me and I’ve worked with groups like the Massachusetts Audubon Society and the Manomet Bird Observatory. I also enjoy painting very small, highly detailed oil paintings of all kinds of subjects. I’m also creating house/garden decorations of leaves made of concrete. They are molded from actual leaves and are then hand painted and sealed. Do you have any other favorite vegan makers? Tell me about them! I would have to say the My Thai Vegan Cafe in Chinatown in Boston. Vegan/vegetarian restaurants did not exist in the 1980’s! For a long time the only veg restaurant in Boston was ‘Country Life’, which was toward the waterfront. They’re in Keene, New Hampshire now. But if I’m at a fair of some sort I’ll always gravitate toward the vegan businesses first. Having been involved in this dynamic for as long as I have it’s a real pleasure to see so many younger people starting vegan oriented businesses.